As our society continues its transition from the Industrial Age to the Digital Age, new challenges are being introduced into the workplace, giving rise to a new phenomenon, Virtual Distance, comprised of three major axes: physical distance - geographic, time zone, or organizational; operational distance - multitasking, communication problems, and technical difficulties; and affinity distance - cultural differences, interdependence distance, working relationships, and social distance. 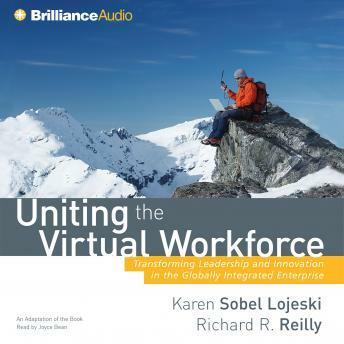 Part of Wiley's Microsoft Executive Leadership series, Uniting the Virtual Workforce introduces the concept of Virtual Distance to show businesses the definite costs to doing work in a virtual environment. It then goes a step further and offers proven methods for measuring these costs and guidance on managing them. Wherever your organization is in its understanding of Virtual Distance, Uniting the Virtual Workforce covers: • How the transition to a "virtual" workforce creates real challenges to collaboration and innovation and how to measure and manage the impact • How Virtual Distance impacts productivity and innovation and offers insight and guidance on how to manage these new risks • A historical perspective on "distance," exposing the so-called "death of distance" as a myth, and showing how our understanding of distance in the virtual workplace must include psychological, as well as physical, spaces Today, almost all organizations are struggling with the impact that virtualization is having on the workplace. Yet, a full comprehension of the costs of virtualization is lacking. Uniting the Virtual Workforce: Transforming Leadership and Innovation in the Globally Integrated Enterprise presents a better understanding of Virtual Distance and the impact it has on people and performance in today's workplace, providing the essential tools necessary for minimizing its impact going forward.